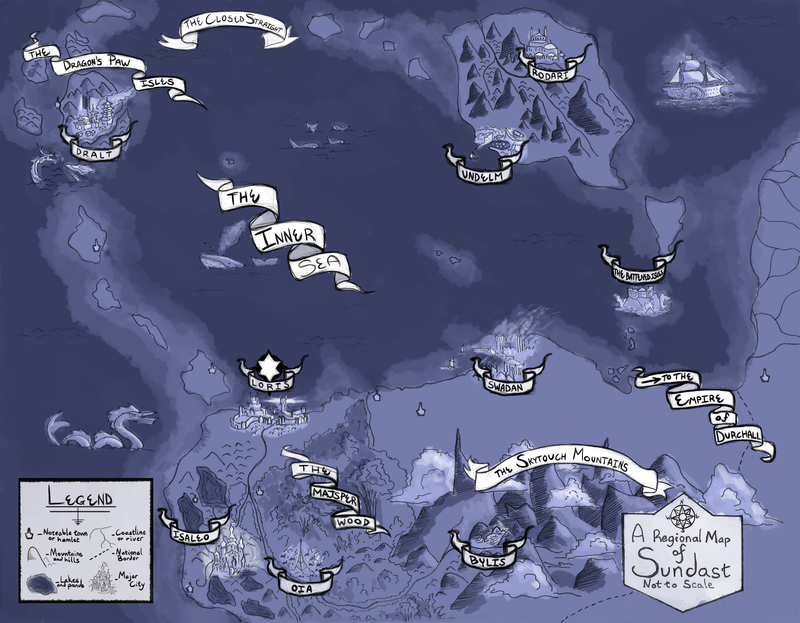 Sundast: A Kingdom on the southern half of the Durchali Landmass, once known as the magical capital of the world. Presently the ruling house has outlawed magic in every form and forbidden trade out Kingdom. Once home to the Western Mages, and one of the Elemental Councils. 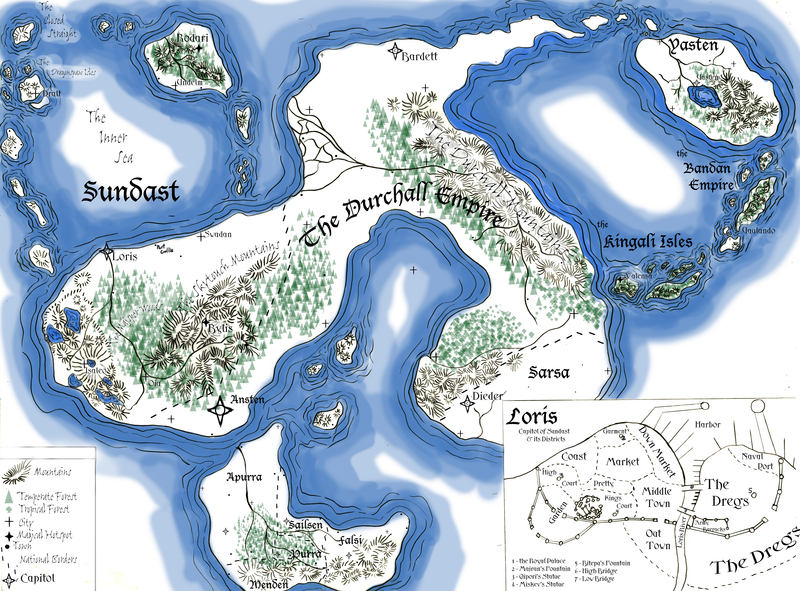 The Durchali Landmass: The large landmass that holds the countries of Sundast, The Durchall Empire, the far southern Sarsa and the City-State of Ansten. Its lands span many different climate zones from temperate forests to dense jungles, hot deserts and frigid tundra. The Durchall Empire: The largest country on the Durchali Landmass, it has the widest variety of climate and people living in its borders, from graceful plains and grasslands to elegant and vast forests and tall, sky scraping mountains. Ruled by a young and head-strong, yet capable Emperor in the great capital of Bardett far to the north, Durchali is a place of relative peace and advanced Eastern Magic. The Great Mage, a position held amongst the Eastern Mages, resides here. Durchali covers much of the Durchali Landmass that also houses Sundast and Sarsa. Ansten: A large city-state south of Sundast, Ansten is famous for its complete autonomy from the rest of the world. It is run by a democratic council of electives whom decide the major issues of the city and the lands that supply it. Each section of the city and the surrounding farms has at least one seat on the council. They have serious wealth in many things such as textiles and wines, and it is considered a wealthy person who has things from Ansten. Yasten: A great nation on the Yasten Landmass east of Durchali, Yasten is famous for its silks, herbs and spices and most notably for its Two King Royal House. Yasten’s throne is tied to a marriage union between two people of the same gender, be it man or woman (though there have only been two Queen pairs in the history of the nation). As such the Royal line is passed through the blood of the High King, and not his partner. The Kingali Isles: A small group of islands off the southeastern coast of the Durchali Landmass. Mostly tropical, the Kingdom is most famous for the Magic School, the place of learning for most Eastern Mages of myth and lore. Its people are in constant struggle for power on the throne. The Bandan Empire: An island nation northeast of Kingali, built up of numerous large and small islands. Its islands are lush with life and good earth. It has fostered years of prosperity and peace within its borders. It is however, a large target for pirates, and as such has developed a much more harsh view of society. Everyone is given the chance to learn self defense, and women have much of the same rights as men. The Appurenad Landmass: A small landmass in the far south of the world that sits on a high plateau causing for a very temperate climate. A small mountain range on the southern coast of the continent dominates over the lower lands. The Appurenad Landmass is home to 5 countries: Sailsen, Appura, Purra, Menden, and Falsi, collectively known as the Appurenads. All five countries are famous for their individual breeds of horses. The initial species originated there, and over the centuries the people of this continent groomed them to specific climates and terrains. All who come from here have an innate connection with horses. The Appurenad landmass is the last known lands to the people of the world. The Endless Outer Ocean: The waters surrounding the lands of the world. Much of the waters are uncharted, though it has been noticed that there are numerous islands dotted within the waters. The people living there seem to be savage and have magics and beliefs far different from those of the continents. The Water Nomad tribes may know of all the islands of the Endless Outer Ocean, but like most of their traditions they keep them close to their own people. Sarsa: A mostly arid, desert nation, it is known best for its nomadic tribes of camel herders and its great variety of precious gemstones that can be mined beneath its soil. An elderly sultan currently holds the ruling house, and most of the day to day work is performed by his First Wife, a young and confident woman. Women have little power normally in Sarsa, and it is unconfirmed if the First Wife is working for her Sultan’s benefit, or of her own accord. Sarsa is famous for its open brothel’s and even more open regard to marriage of multiple wives.